HPI Ford Focus Hybrid! « Big Squid RC – RC Car and Truck News, Reviews, Videos, and More! We have all been waiting anxiously for the HPI Racing eXtreme Gas motors and vehicles to arrive. 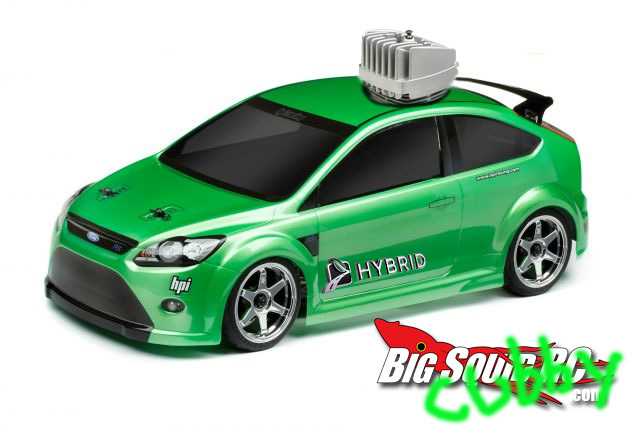 Well, HPI has decided to go one step further with the new Ford Focus Hybrid! It will combine the power of a brushless system as well as the eXtreme Gas system. HPI says we can expect about 7 minutes of run time on electric, then it will automatically switch over to gas where we can get another 20 minutes! Most electric RC’s get much longer run times, but HPI says with the weight of the gas motor and fuel, 7 minutes is it. That’s ok. I’m excited to see HPI going green and giving us some hybrid options for the people who don’t want to just make the jump to gas. Visit the HPI Racing site for details.